With a brand new format and new questions from the show, The Chase: The Greatest Chases is the ultimate indulgence for fans of ITV’s most popular quiz programme. 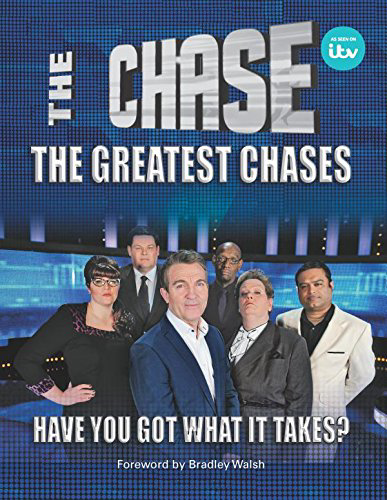 Containing 50 of the most difficult chases where contestants actually beat the Chaser, this book challenges you to do the same and defeat one of the show’s stars: The Governess, The Beast, The Sinnerman, The Barrister and The Vixen. Have you got what it takes to beat them at their own game, and answer the questions that they couldn’t? With over 3,500 tough questions to test yourself against, this is the ultimate challenge for viewers who reckon they could take on a Chaser… and win. A Chase quiz book with a difference; see if you have what it takes to succeed where the Chasers have failed. 384 pages.